This is a special post for California readers. The rest of you may safely ignore it. 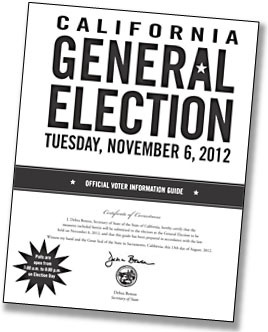 This year we have 11 initiatives on the California ballot. As longtime readers know, my default position is to oppose all initiatives. Here’s the nickel version of a longer rant about this: (1) Most initiatives these days are funded by corporate interests, not the grassroots, and corporate interests don’t really need yet another avenue to work their will on the public; (2) generally speaking, laws should be laws, not constitutional amendments or initiative statutes, where they’re essentially etched in stone forever; and (3) ballot box budgeting is a curse. So keep my biases in mind as you read this. It’s worth noting that my dislike of initiatives softens a bit when there’s no choice in the matter. We Californians have passed a ton of initiatives in the past, and since that etches them in stone (see No. 2, supra) it means that the only way to change them is via another initiative. I don’t like it, but that’s life. I’m mentioning this because several of this year’s initiatives fall into this category, and they account for every single one of my Yes recommendations. Sacramento failed to do so, I’d take that as the will of the people and let it go. But that’s not how things are, which means a ballot initiative is the only answer. This one isn’t perfect, but it’s not bad. It deserves a Yes vote. There’s a competing tax measure, Proposition 38, also on the ballot. More on that below. Miscellaneous budget and local government reform: NO. Proposition 31 has some good points. Providing a small financial incentive for local governments to coordinate public services might be a good idea. It’s also got some iffy points. Allowing the governor more authority to cut spending in an emergency is a so-so idea. And it’s got some bad points. Micromanaging the budget process is a bad idea, and so is Prop. 31’s too-vague plan to allow local governments to override state regulations. All in all, Prop. 31 is a hodgepodge that just doesn’t pass a high enough bar to deserve support. Paycheck protection: NO. This zombie initiative—the third of its kind in the past 14 years—would forbid unions from deducting money from workers’ paychecks for political purposes. It’s ostensibly nonpartisan because it also bans corporations from doing this, but that’s like passing a law making it illegal for both workers and managers to go on strike. Corporations don’t do this in the first place, so in practice this initiative crushes the political power of unions but does nothing to rein in the political power of corporations. It’s a scam. Auto insurance: NO. This is another zombie initiative, backed by the zillionaire CEO of Mercury Insurance, who tried to get a nearly identical initiative passed in 2010. Here’s the short argument against it: Prop. 103, passed in 1988, allows insurers to consider only factors related to the likelihood of filing a claim when they set rates. Prop. 33 would add another factor by allowing insurance companies to provide discounts to drivers who have been continuously insured—a factor that, it turns out, has little relationship to the risk of loss. Prop. 33 might very well benefit Mercury Insurance, which could more easily poach business from other insurers if it passes, but unless you’re a Mercury stockholder that’s not a very good reason to support it. We’re better off keeping Prop. 103 the way it is. Replace the death penalty with life in prison without possibility of parole: YES. The death penalty has never been one of my big hot buttons. Still, there’s mountains of evidence that it’s applied unfairly and sometimes imposed on innocent defendants, which is reason enough to get rid of it. But it’s also worth getting rid of the death penalty because it simply doesn’t work in California. Hundreds of people sit on death row for decades at a time, and millions of dollars are spent defending them, all with little hope of the death penalty actually being imposed. Only 13 people have been executed in California since 1977, and a federal judge imposed a moratorium in 2006. It’s time to end the death penalty farce, and since it was originally imposed via initiative, the only way to do this is via another initiative. Human Trafficking: NO. California may or may not need better human trafficking laws, but it doesn’t need this sloppily written initiative that’s yet another pet project of a local zillionaire. These kinds of laws should be written by legislatures, not carved into stone forever by ballot initiatives. Three strikes: YES. Prop. 36 modifies our three-strikes law so that 25-to-life sentences are imposed only if the third strike is a serious one. This is just common sense. However, since the original three-strikes law was passed by initiative, the only way to make this change is via another initiative. It’s worth a Yes vote. Also read Tom Philpott on how Big Ag is spending millions to keep labels off GM foods in California and watch Michael Pollan talk GMO labeling. 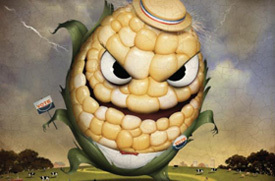 GM food labeling: NO. I’ll confess to mixed feelings about this. But I’m afraid mixed feelings mean a No vote. I respect the desire to know where your food comes from, regardless of whether you want to know different things than I do, but on a substantive level I’m not convinced that GM foods pose enough of a genuine hazard to rate detailed labeling laws that are etched in stone forever. Also: This initiative, as with so many initiatives, is sloppily written; it can’t be changed after it’s passed; and it imposes expensive state labeling burdens on interstate commerce, something that I’m increasingly leery of. I’ll also note that I’m swayed by our experience with Prop. 65, which imposed labeling requirements for toxic chemicals. In the end, so many warning signs got posted that they became essentially useless. I have a feeling Prop. 37 might have the same result. For a different view, check out Tom Philpott’s take on Prop. 37 and its detractors here. Temporary tax hike to benefit schools: NO (with an asterisk). Prop. 38 competes with Prop. 30 as a tax measure to benefit public schools. Here’s the calm, collected argument in favor of Prop. 30: (1) it takes effect immediately, and (2) it allows the legislature more flexibility in using its funds than Prop. 38, which strictly earmarks its revenue. Since I’m a sworn foe of ballot box budgeting, I prefer the Prop. 30 approach. A bit of flexibility is a feature, not a bug. And now for the decidedly non-calm argument. California needs a temporary tax hike. So last year Gov. Jerry Brown did what we elected him to do: he engaged in a bit of horsetrading and hammered out a tax proposal. Liberals rebelled, compromises were made, and Brown’s measure eventually got wide support from most of the state’s major political players. This means that it’s not perfect. Real world compromises never are. But it’s still pretty good. So what happened? We got a competing measure funded by yet another local zillionaire, heiress Molly Munger (she’s the daughter of Warren Buffett’s business partner). And in some ways Prop. 38 really is better than Prop 30. But so what? Prop. 30 is pretty good, it’s widely supported, and the main effect of Prop. 38 is to confuse everyone and increase the risk of neither initiative passing. That’s especially true since Munger has turned this into a death march, spending her fortune not only to promote Prop. 38, but to run negative ads against Prop 30. And needless to say, this is all in addition to the usual barrels of money being poured into the Prop. 30 opposition by California’s anti-tax jihadists. Thanks, Molly! Self-absorbed purity contests like this really piss me off, and I would sure appreciate it if California’s zillionaires could find something else to do with their riches. That said, here’s the asterisk: if you do vote Yes on 38, at least vote Yes on 30 too. That way we still have a good chance to get something passed even if Prop 38 fails. Don’t insist on drowning the passengers just because your particular lifeboat doesn’t get chosen to rescue a sinking ship. Tax treatment for multistate businesses: YES. Back during some last-minute bargaining over a tax bill during Arnold Schwarzenegger’s term, legislators decided they didn’t quite have the courage to change California’s corporate tax code from a three-factor system (based on sales, employment and property) to a simpler system based solely on in-state sales. So they kept both systems and allowed corporations to choose whichever one gave them a lower tax bill. This was dumb, and it costs California about $1 billion per year. Unfortunately, thanks to Proposition 13’s requirement that all tax bills require a two-thirds vote, it’s impossible to fix this kludge because the anti-tax jihadists consider it a tax increase. So a ballot initiative is our only option. Prop. 39 is a sensible proposal that produces better tax incentives for corporations, stops them from gaming the system, and raises a bit of money all at once. Unfortunately, it also earmarks some of that money for special purposes. But it’s a temporary earmark, so it’s still worth a Yes. Redistricting: YES. This is a weird one. Originally it was a Republican referendum on the state Senate redistricting plan approved by the California Citizens Redistricting Commission, but in a ruling earlier this year the California Supreme Court indicated that even if the plan were nullified it would probably draw pretty similar lines itself. So backers, who wanted a No vote (which would overturn the CCRC plan) gave up. However, there was no way to remove Prop. 40 from the ballot, so it’s still here. A Yes vote upholds the redistricting plan, and no one is opposing that.